This beautifully hand colored 1814 Thomson map shows modern day Belgium, here called the Netherlands divided into thirteen departments. 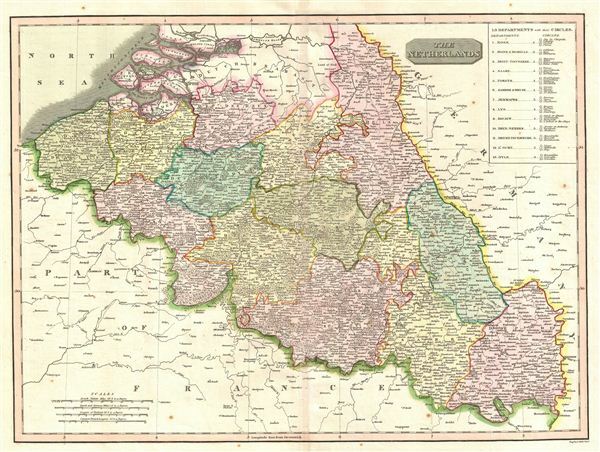 The labeled the Netherlands or 'Low Countries' for their elevation, this map focuses on modern day Belgium. Thomson maps are known for their stunning color, awe inspiring size, and magnificent detail. Thomson's work, including this map, represents some of the finest cartographic art of the 19th century. Engraved in 1814 by J. Moffat, Edinburgh and issued as plate 17 for Edinburgh cartographer John Thomson's 1817 edition of the New General Atlas. Very good condition. Light soiling to outer margins. Original platemark visible. Blank on verso.